Recipe: Strawberry Mini Toasts | Finding delight. As a budget-livin’, wannabe foodie I try to eat produce seasonally (and when possible local). This means by the end of Winter I am less than excited by apples, pears and citrus. I cheated a bit and made these Strawberry Mini Toasts when my store put strawberries super on sale for Valentine’s day. I love making these in the summer for a light meal with a glass of wine. Having these in the midst of yet another snow storm was just the breath of fresh air I needed! Luckily, strawberries are the first fruit to ripen in spring and early summer so you can nom on these toasts all the time soon enough! This recipe also calls for basil which I can get fresh and locally year round. If you can’t, you can use dried basil or leave it off the top. : ) Enjoy! 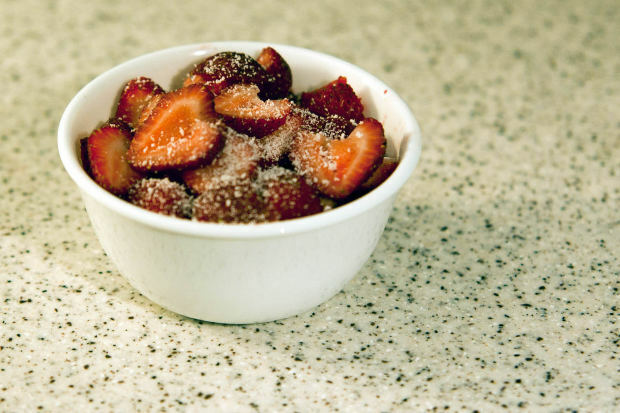 Combine your sliced strawberries in a bowl with a tablespoon of sugar. Toss them a little and let them hang out for half an hour. Spread your preferred goat cheese on the baguette. Pile on some strawberries and drizzle balsamic vinegar all over. Top with basil ribbons and a few cracks of pepper. Pair with a dry vignole and you’ve got a super simple dinner that feels kinda fancy. Just how this lazy, busy girl likes it! Pingback: Recipe: Avocado Toast | Finding delight.